Rates listed for 2017, subject to change. 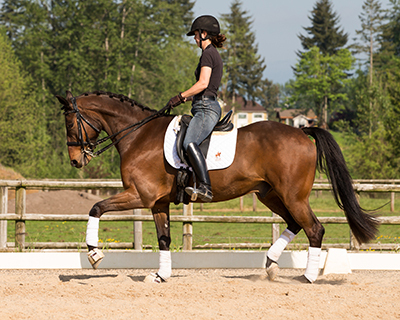 The SKM Dressage training program focuses on the development of both the horse and the rider. Exercises and movements are used as building blocks to advance the pair in a steady pace with focus on foundational dressage training. Through correct timing and effective use of aids, the rider learns to ride with the horse instead of just on top of it. Shaun's approach to training provides a learning environment where the horse and rider thrive at home and achieve success in the show ring. Our comprehensive training program is located at Tower Lane Farm in Auburn, Washington. Please feel free to contact Shaun to find out how SKM Dressage can tailor a training package to suit the needs of you and your equine partner. Successful FEI competitor and USDF Silver Medalist, Shaun Myers has been involved in the dressage community for many years. In 2004, Shaun established SKM Dressage, a now extremely successfully Dressage training and sales business. Shaun continually pursues ongoing education by working with notable Olympic level trainers throughout the United Sates. Shaun strives to further her own abilities in effort to better serve her clients and her own personal growth. Shaun’s dressage resume is outstanding; she has taken multiple horses from the ground up and completed at the highest levels of dressage earning her national recognition year after year.